Ottawa – November 24-26 Meetings of the Co-operative and Mutuals Canada (CMC) Board of Directors, Canada’s Emerging Co-operators, CMC Delegates and the Provincial Associations/Conseils all took place in Ottawa November 24 to 26. These meetings are central to advancing the goals of our members. The principal theme of the week was what to expect from and how to approach the newly elected government in Ottawa. CMC is requesting support from the new government for our investment fund and our co-operative development strategy, The Roadmap for a Co-operative Decade. 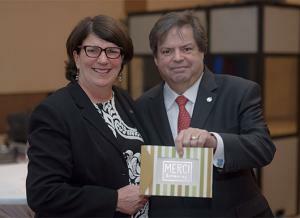 With so many co-operative sector leaders gathered in Ottawa, CMC President Jack Wilkinson took the opportunity to thank a key ally and friend over the last few years, MP Mauril Bélanger. Mr. Bélanger worked tirelessly as the Liberal Party Advocate for Co-operatives in the 41st Parliament. He was instrumental in securing the Parliamentary Committee on the Status of Co-operatives in 2012 and the Co-Chair of the All Party Co-operative Caucus in 2014. In the days since our Delegate meeting and Parliamentary Reception, Mr. Bélanger has shared some heartbreaking news about his health. He has been diagnosed with Lou Gehrig’s disease (ALS). There has already been an outpouring of sympathy and support from the co-op sector, and we wish to reaffirm that support to Mauril and to his family as he confronts this challenge. Mr. Bélanger has done a lot for co-operative issues on Parliament Hill and we will honour his work by working with him to bring those efforts to fruition.